Hey yo … super cool guest today on Data Stories. 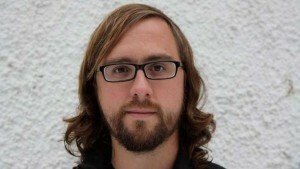 We have data artist Jer Thorp for a whole episode on Data Art and Visualization. We managed to catch him before he leaves for a deep dive in a submarine next week. In this episode we talk about his past and new projects, teaching art and vis and the many intersections between art and science. Some great artistic insights to data. I quite enjoyed the thoughts on process, and how the process of getting to some conclusions could actually be a more important part of working with data. The process theme reminded me of listening to lengthy artist talks from the Tate museum – they’re available online – and what the artists almost exclusively talk about is the process of getting to a work of art. The Tate talks made me realise that sometime the artworks are only the last, almost minimal, step of a long process of discovery, and that it would be really interesting to see the processes leading up to artworks. I’m also happy that the topic of rigour and investigation was brought up. This, I suppose, partly relates to the process thread above. There are many forms of art, of course, but quite often there’s a long process of investigation involved, that goes overlooked. One could be tempted to say that one of the nice things about art is that people often get to take an extended – and needed – period of time to investigate a topic. That’s not quite always something that happens in the design sphere. Thanks for a great podcast – it covered really very many topics and threads that are interesting, and that are very important for communicating and understanding the world through data. Just as a ps: I’ve been listening to a international development podcast called Development Drums, run by the Center for Global Development. The topics revolve around how countries are understood and how localities and/or states be ‘developed’. Very often decisions about development – i.e. typically political decisions – are taken based on statistics. It struck me, listening to the podcast, this is certainly a field that has tried using statistics for decisions, for a quite long time. The reflections various guests have had about the politics of data, data collection and data based decisions, have been quite eye-opening.